On my last saltwater page I wrote about the difference in size between lure-caught and bait-caught bass. Of course it's not a clear cut thing and several of my biggest fish have been taken on lures. 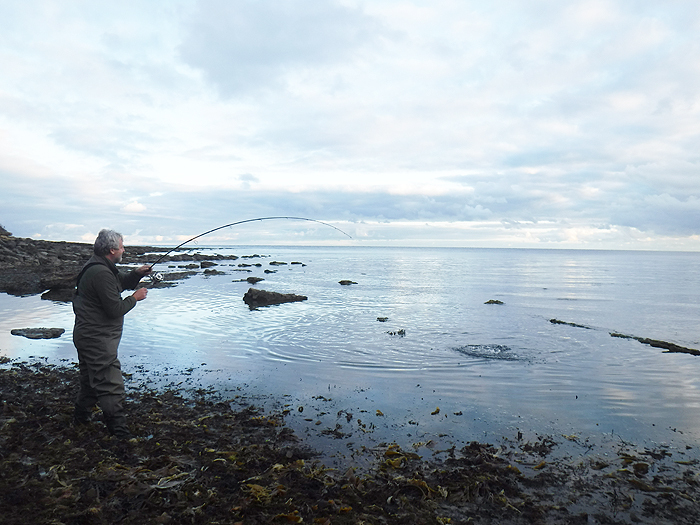 Almost all my fishing for many years has been from the shore so it's a matter of picking a place according to tides and weather conditions, particularly the strength and direction of the wind at the time of fishing and before it. There was a classic example a few days ago when the wind dropped right away after a week or so of really awkward rough conditions. 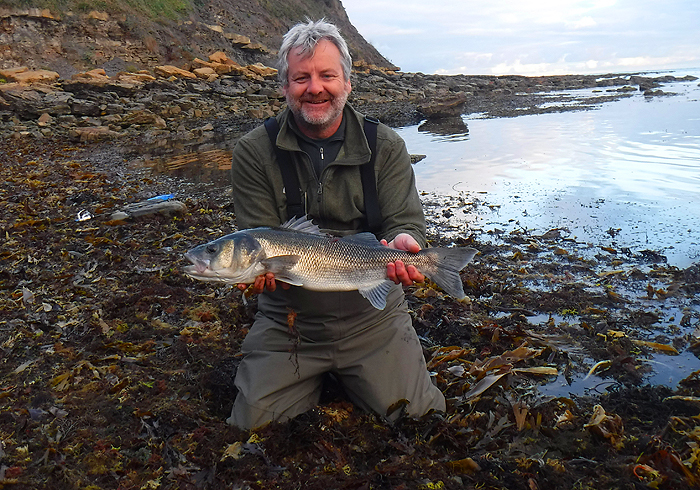 The rough weather had coincided with big spring tides and this is often a prime opportunity for catching bass and mullet 'off the top' when they come in to feed on seaweed fly maggots. Sure enough the bass were there and although it was very difficult for fly fishing there were enough bass about to make the fishing very entertaining. The majority of the fish were schoolies with not more than two or three percent of the ones we caught weighing more than four pounds or so. Once the calm conditions looked as though they were 'set in' I checked the tide table and found that it would be low water more or less at dawn and a bit before dusk - perfect for a spot of freelining. The first (and probably the best) day I was unable to fish because we had to go to an archaeology meeting - I was a bit fretful but there was no choice so I opted to try the following evening. After we'd had our tea I took a mackerel fillet from the freezer, thawed it in a spot of boiling water (I don't like doing that as it softens them), slung the rod and the bag in the car and set off for the coast. Sure enough when I got to the shore the sea was flat calm and the tide was still well out. I walked quickly along to my chosen spot, which I knew would be easily fishable, only to find that there was already someone else on the rocks just setting up his gear. 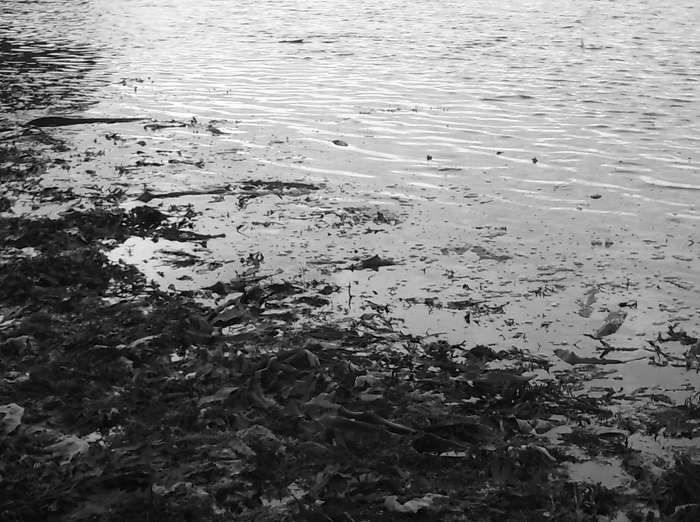 Not wanting to disturb the other bloke I made a quick decision to have a look at a similar little inlet a hundred metres or so further along, although I expected it to be much weedier and more difficult to fish. 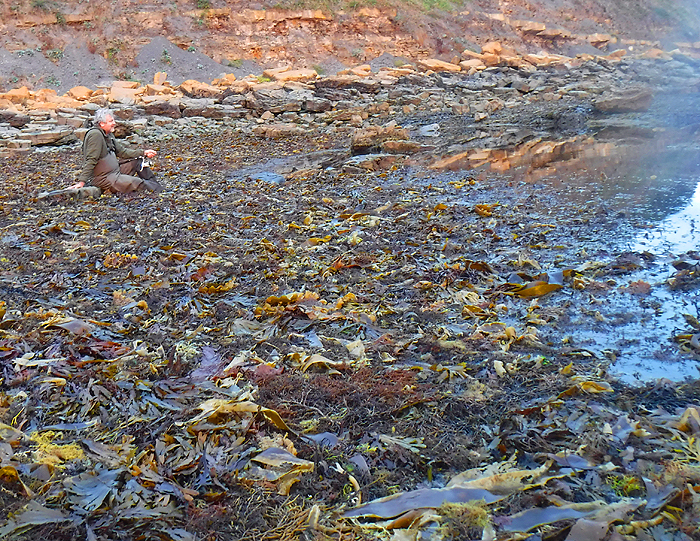 Sure enough, just as I expected, the rocks at the next mark were knee deep in loose wrack and kelp fronds. However, as I approached I thought I noticed an unlikely disturbance in the calm surface. I slowed my approach and watched carefully to see that there were bass tailing close to the edge of the weed. Bonus! 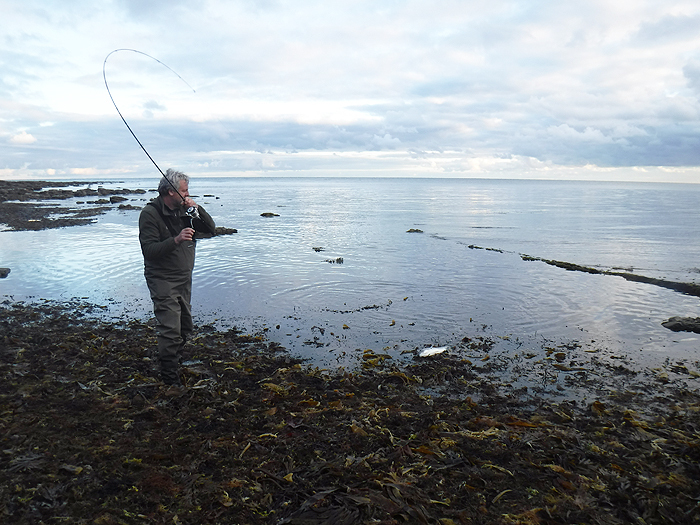 I put the bag on a boulder well above the water level and baited up with a mackerel fillet. As I took the bait from its bag I found that there were in fact two fillets stuck together (I left the spare one in its bag and crept down towards the water's edge). The fish were still there and apparently feeding so kneeling in the weed I swung the bait out a couple of metres and waited. For five minutes nothing happened and I was becoming frustrated. There seemed to be quite a few fish out there but nothing was taking my bait. I reeled in and swung the fillet out to a spot where I could see several tails. I thought that this might have been a mistake and that the splash could have dispersed the feeding bass but it didn't. A few more minutes passed with me holding my breath then suddenly the line twitched and began to run out. I let the fish go as far as I dared (there were a few rocks sticking above the surface) closed the bale arm and I was in. Fantastic. 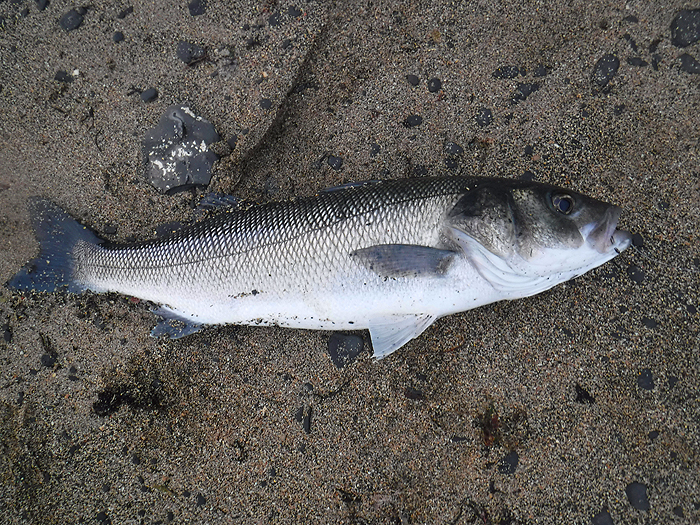 I played the bass in, unhooked it, measured it, took its picture, returned it to the sea and watched it swim away. At this point I would normally have packed in and gone home but I remembered that I'd left another bait on the rocks (I'm very mean and often only take one bait with me). I looked at the sea and there were still bass tailing close in. Despite all the kerfuffle of landing my fish in the small rocky gully I hadn't scared them away. I baited up again, this second bait was a bit soft and had obviously suffered most from my hot water treatment. I swung the fillet gently out again. Within minutes the line began to run out once more I was into another good bass. I played and landed this one before taking its picture and putting it back then I picked up my gear and set off back to the car. I looked at my watch - I'd only been fishing for twenty minutes - should have brought more baits. When I got home I emailed my fishing pals to tell them what I'd been doing then I put a couple of frozen herrings in the bait bucket for the next morning. Well - I HAD to have another go didn't I? At 06:15 as I rolled into the car park my pal Richard Gardiner was just getting his rod out of the car. He said that it was a light rod and he wasn't sure it would be entirely suitable for bait fishing but, to be honest, as long as you can lob a bait a couple of metres it will be OK because when you use a circle hook there's no need to strike and it is simply a matter of pointing the rod straight at the fish. Anyway, Richard had read my email and decided to give it a go. We walked along together to the 'hot spot' and of course the tide was even lower than on the previous evening. There was no sign of fish so while I sat and watched for them to arrive (I hoped) Richard walked along to look at another spot. In fact it wasn't more than ten minutes before I noticed a couple of swirls and within twenty minutes there were fish tailing just like the night before. Richard came back and we each lobbed a bit out and sat quietly waiting. I seemed to have chosen a fishless area and being rather impatient I reeled in after ten minutes and repositioned the bait. Shortly after I had done my adjustment Richard reel sang and I looked up to see his spinning rod well bent. Clearly it was a decent fish so I reeled in and grabbed the camera. He landed his fish (getting on for eight pounds) and we took a few pictures before he returned it. Magic! After that although the fish were still in evidence - nothing! So we packed in. A few fins showing above the surface - often there were many more but the camera was in its bag. My best fish of the evening session 6.5lb. Richard waiting patiently for a bite. Would you call that a lot of weed? Whoooaaa! His little spinning rod's well bent. Got it! It doesn't look so big as it slides ashore but it's a beauty. � PLEASE TELL YOUR TWITTER, FACEBOOK, EMAIL FRIENDS ABOUT THESE BOOKS. "Fishing for Ghosts - Successful Mullet Angling"
written with David Rigden IT'S AVAILABLE FROM - "The Medlar Press"
Written with Steve Pitts this is a SEQUEL TO THE BESTSELLER "Operation Sea Angler" IT'S AVAILABLE ON PAPER OR FOR YOUR KINDLE FROM - "Veals Mail Order" and from Amazon "Amazon"